If your Evesham Township family is looking for a new vehicle to put in the driveway, look no further than the 2018 Honda Odyssey, now available at Burns Honda! The 2018 Honda Odyssey offers enough space to fit everyone and everything you might need during your journey. It also features cutting-edge tech and entertainment that’s sure to keep the peace in the backseat! 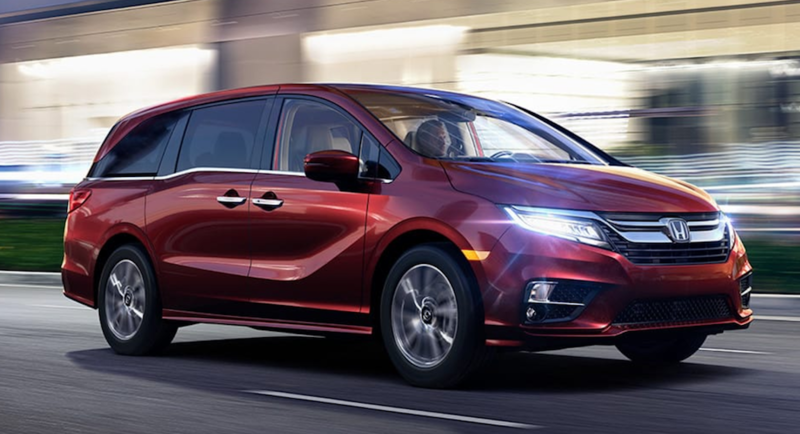 Already one of the most popular models from the brand and one of the most popular minivans on the market, the next-generation Odyssey gets even more impressive for the new model year. It’s the first minivan to offer the option of a 10-speed automatic transmission. This 10-speed transmission helps to deliver a more refined performance and as a result, provide the driver with more confidence behind the wheel—which is especially important when the whole family’s on board. With the new model year comes a sophisticated redesign for the Odyssey. It features the brand’s signature flying wing front grille and a bold front fascia that conceals the new Active Shutter Grille. The Odyssey’s Active Shutter Grille helps to increase fuel efficiency overall, so Burns Honda shoppers can spend more time making memories on the road with their families and less time stuck at the gas pump. The cabin also features upgrades for the new model year. Relax is an environment made of high-grade materials like stain-resistant leather. The cabin in the 2018 Odyssey provides a quieter-than-ever experience for all passengers, thanks to the triple seal door, available acoustic front and side glass, and an increased use of sound deadening materials under the floor. Whether you’re driving around Evesham Township or taking the family on a long road trip, it’s important to stay connected and to keep your passengers entertained. Parents will love the all-new available tech options that make it easier to keep an eye on backseat passengers. CabinWatch allows the driver and front passenger to keep tabs on rear seat passengers via the display audio touchscreen. With CabinTalk, the driver can easily communicate with the second- and third-row passengers through the second- and third-row speakers and rear entertainment system headphones. Speaking of the available rear entertainment system, it’s a great way to make sure that you can enjoy a peaceful drive without the little ones becoming restless. The system allows second- and third-row passengers to watch streaming video or their favorite movies through the ceiling-mounted, 10.2-inch rear entertainment screen. Our Evesham Township Honda dealer understands how important safety is in all vehicles, but especially those that’ll be carting around those who are most near and dear to you. Honda engineers work to consistently raise the bar on safety, and the 2018 Odyssey is no exception. The available Honda Sensing suite of advanced safety and driver-assistive tech features includes Lane Keeping Assist, Road Departure Mitigation, Collision Mitigation Braking, and more to further enhance the protection of all vehicle occupants. Built with the Honda-exclusive Advanced Compatibility Engineering (ACE) body structure, the Odyssey’s construction helps to distribute crash energy more evenly and redirect it away from the passenger compartment. These are just some of the innovative safety features offered in the Odyssey. Visit us today for a first-hand experience of all of the protection the 2018 Honda Odyssey has to offer. For more information about the 2018 Honda Odyssey or to schedule a test drive, contact us at (855) 571-4861.